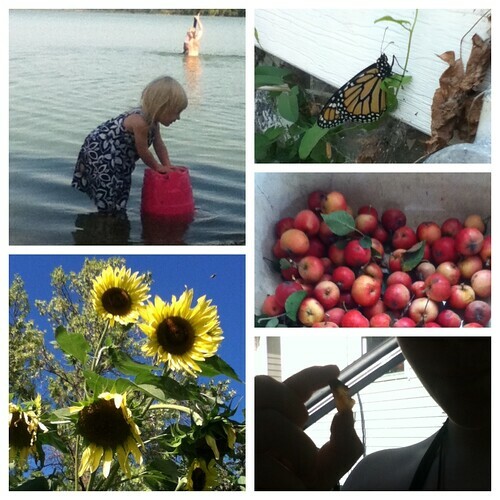 A big part of our “curriculum” this time of year is nature. We spend as much time as possible outside and much of our life in general is dictated by nature. We are harvesting in the garden, “putting up” produce like non-GMO corn from a nearby farm and homemade pickles with farmers’ market cukes, cooking like crazy with extra zucchini gifted by others, watching wildlife, spending days at the lake, foraging, climbing trees, playing and eating nearly every dinner outside in the back yard at our new farmhouse table. This week was a pretty great week for nature studies. 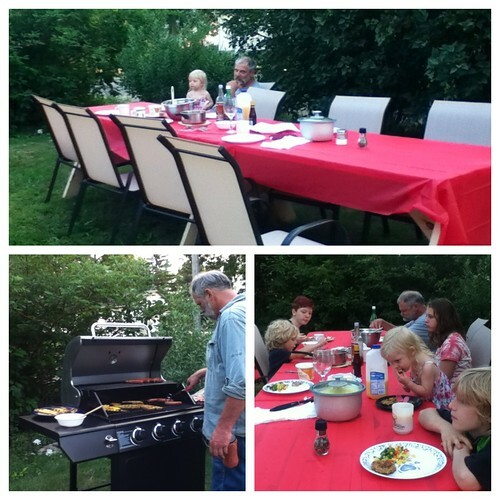 Here’s some of what we did…. 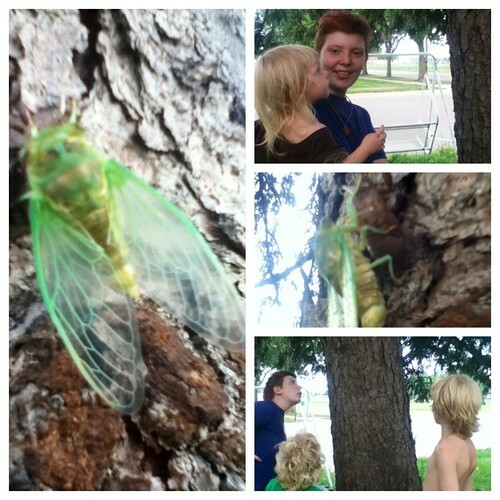 We watched a cicada emerge from his alien-like skin with his new green wings. We watched a monarch butterfly emerge from its chrysalis right by our back door, pump its new wings until they were dry, and fly away. 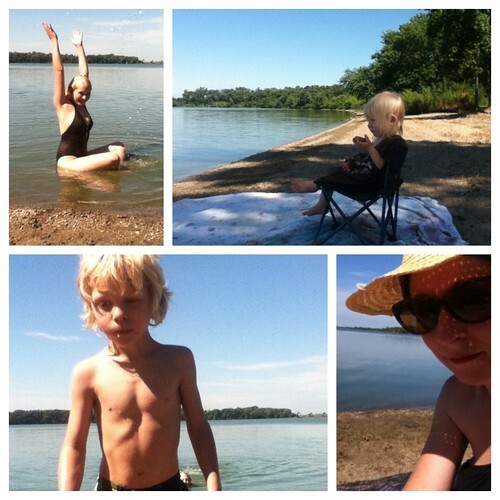 We swam at the lake many times and played with sand, water, driftwood and water bugs. Victoria found some neat rocks and an arrowhead artifact at the lake, and was with Daryl when he found another fossilized shark tooth. Alex and Jack helped Daryl forage for acorns, walnuts, apples and crab apples. The boys always excitedly gather any acorns or walnuts they come across to bring home to process, which tickles me since 99.9% of the world considers them nuisances for the lawnmower. Daryl and the kids “foraged” for apples and crab apples by getting permission from various owners who said they would not be harvesting them and who gave us permission to pick them. These were all organic apples since the owners didn’t plan to harvest them and therefore didn’t spray them. Alex helped Daryl made applesauce from the apples and crab apples and we canned many pints and quarts of it for the winter. We talked about why our new pressure canner can safely preserve low-acid foods. I made gluten-free apple cake with acorn flour (and other gluten free flours) we made from acorns Daryl and Alex gathered at our UU church, then we brought the flour for everyone to see and smell (it smells divine). We’ll be bringing them baked good samples and printed instructions on how to do it themselves, too. (Here’s the recipe I used for the apple cake, substituting acorn flour for the soy flour.) The apples were also foraged ones, and the eggs were from a homeschooling family down the highway (we buy 5-10 dozen eggs from them at a time from their free-roaming chickens at $1 a dozen), so a lot of the ingredients were locally sourced. Jack and Alex helped Daryl husk walnuts and put them in big mesh onion bags in the garage to dry. We watered and tended our gardens. I use wine bottles for drip irrigation, and Jack helped me fill the bottles. We saw hundreds of dead carp by Talcot Dam, littering the shore. We believe the combination of hot weather and low water just killed them off. It led to more talk about weather and climate change. We saw great blue herons, vultures, sandpipers, cranes, pelicans and other beautiful birds at the lake and in the wetlands that we pass when we head out of town for groceries. Toria, Alex and Fiona found a frog after church and played with him before letting him go. We read from One Minute Mysteries: 65 Short Mysteries You Solve With Science! and the kids used their biology knowledge to try to solve the mysteries in the life science section. We are starting an in-depth family study of ways to convert our house to more sustainable energy, along with various tools we use (for instance, we bought a push reel mower a couple of years ago to use instead of the gas powered one). We are also going to see how far we can lower our utility bill from September of last year and talk to our minister about starting a community garden at our UU church next year (the church is already wind powered, which is pretty awesome and shows their commitment to sustainable living). I made up a batch of elderberry honey syrup to beat a bad summer cold. Jack, Alex and Fiona took part in the Think! challenge to make mandalas from natural objects. The boys made fantastic ones (Fiona just played) and they were posted on the Think! blog. Unfortunately, the blog owner posted Alex’s twice and didn’t post Jack’s at all and she apparently doesn’t read her comments, so you can’t see Jack’s! It was awesome and I’m going to try to contact her again to see if she’ll put his up because I know he’ll be proud to see it online. And that’s why we don’t start “doing school” in late August just because the local schools have started up again. 🙂 Not that we ever do school anyway, but this is just not a sit-down and study kind of season for us. 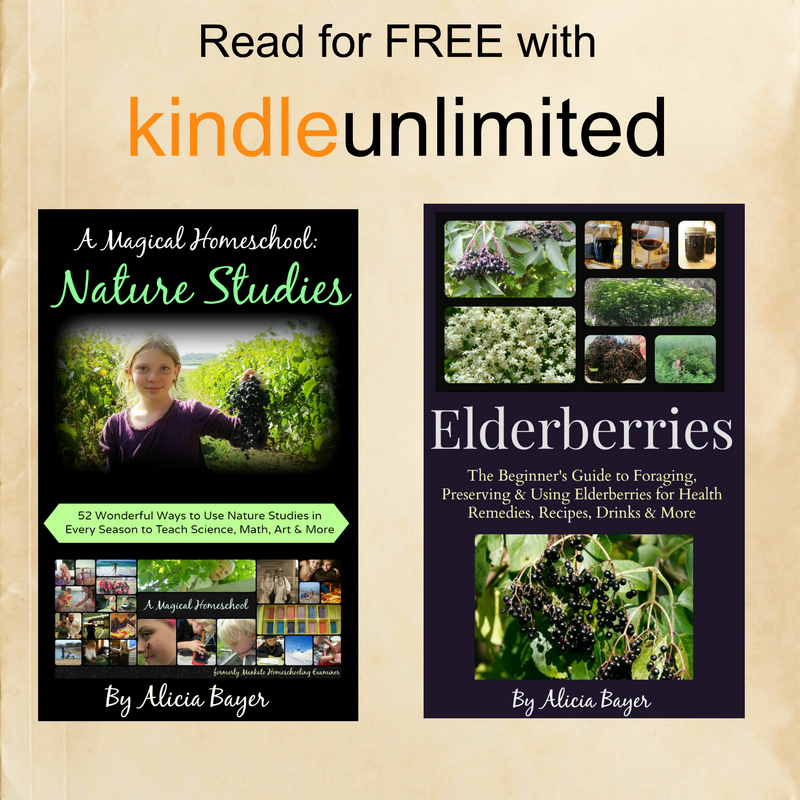 We do homeschooling through the seasons and I love this season. Here’s some free science notebooking pages you can download. Daryl read somewhere years ago that September is the month of winds and magic. Since it is the month of his birthday and our anniversary, it is a special month for us. Happy September! 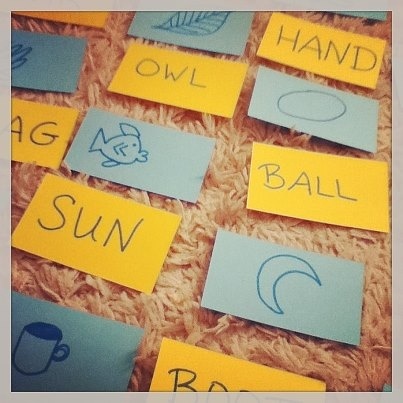 Here’s an example of how we play with words to help our kids learn to read. This is a game Alex and I played yesterday. I’ve done something similar with all of the kids and it always works well and is fun. I wrote and illustrated 15 sets of words (drawings on blue, words on yellow) and then I just spread them all out and have him look for pairs. Our words (short and easy to draw) were hand, sun, moon, egg, ball, flag, fish, owl, boot, door, cup, car, leaf, bug, hat and tree. Later on, the game can be played concentration style (flipped over, try to remember where matches are) but when kids are newly learning to read, just spread them out facing up. Have the child look for matches. Try not to help much, other than when asked for help remembering how to sound out letters. Alex (5) was able to figure them all out with occasional reminders about letter sounds. He can read MUCH easier in this sort of way than just sitting and sounding words out. As a matter of fact, when I just flipped through the cards afterwards, he got very frustrated trying to read the same words he had just matched up. The pictures give just the right amount of help to let kids see themselves as successful readers. He really enjoyed it and was very proud of his stack of accomplished words. 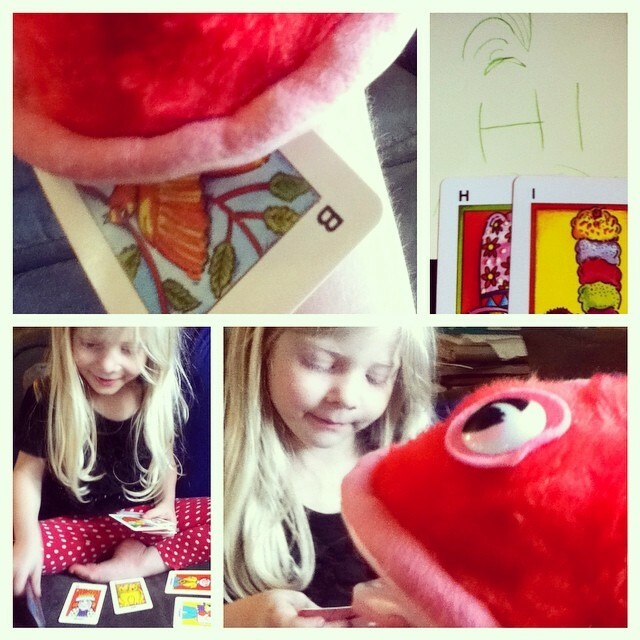 Victoria sounded her first word out (boo) at three and was reading fluently at four. Anna was nearly six when it really clicked. Alex is five now and I think he will be six before it really clicks. We did not use a phonics curriculum, How to Teach Your Child to Read in 100 Easy Lessons, Bob books or any of that. It’s important to note that all of our older kids are voracious readers now (at 9, 13 and 14). Remember that when a child learns to read has no bearing on how well the child will eventually read. Children walk, talk, read and learn to use the potty at their own paces. If you do “walking lessons” with a baby who is not ready to walk, I sure hope you make it fun. It will not help the baby walk much sooner and is completely unnecessary. The new school year hasn’t started yet, but Victoria has already read two of the books on her 9th grade reading list and she loved them both. She’s also been reading a ton of regular YA books for fun, but I think it’s cool that she’s so gung-ho to read from her list so often. She tends to read these books very quickly (getting caught up in them for hours at a time) and really likes them so far too, which is a great testament to books that stand the test of time. P.S. Don’t let your kids read the introductions to classic literature! Our library copy of Lord of the Flies told about the biggest events of the book (in the last chapter) in the introduction. They quoted the very end before the book starts. Pfft!